Now available in a band new packing to easily identify from fake Soldron products, you can also check for the Hologram sticker. Very high quality professional, non-corrosive and non-conductive flux. Ideal for all soldering applications. It causes no damage to PCB's even if a residue is left on after soldering. 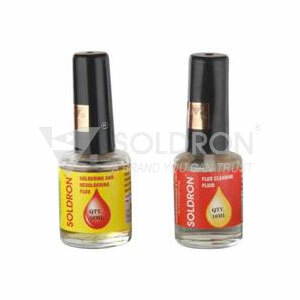 Soldron flux cleaning liquid is ideal to clean residual flux from the PCB.